Hank Beal wasn’t just a parlor plucker. He really knew how to play. As a member of the Salt River Hoosiers, he appeared regularly on radio station WTAO in Hannibal MO. “The Salt River winds around the vicinity of Hannibal,” says John. “My grand- ma’s family, the Daniels, had a farm in nearby New London. If you want to talk about country music, her dad’s name was Charlie Daniels, although naturally he wasn’t the Charlie Daniels. The Daniels family owns the farm to this day. There’s even a Daniels Lake. It’s a man-made body of water that was created by my uncle, Hurley Daniels. 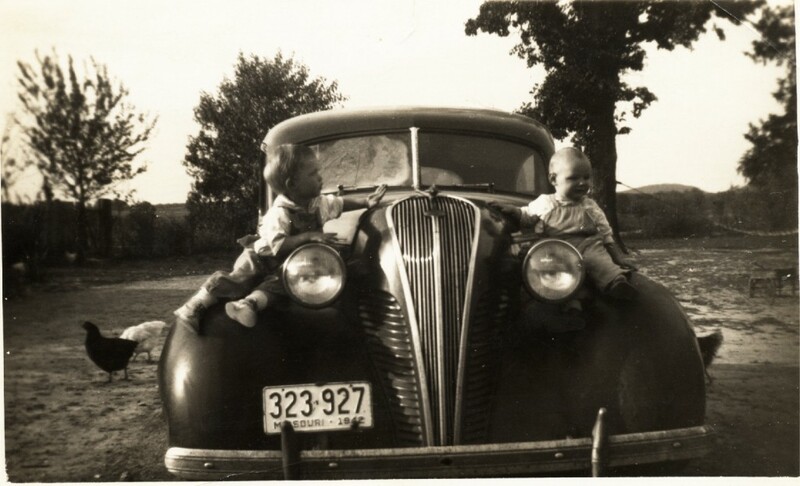 “One day my dad’s brother Frank and a friend went out to the farm to visit Uncle Hurley. As they passed Daniels Lake, they noticed that there were frogs everywhere. They decided to take advantage of this discovery and gigged about 50 frogs, which was just about the lake’s entire population. “When they got to the farmhouse, Uncle Hurley welcomed them with open arms. ‘You boys wanna go fishin?’ he asked them. ‘Go ahead and catch all the fish you want; bluegills, bass, catfish, whatever. You can throw ‘em out for all I care. Just don’t touch my frogs, ‘cause that’s what I’m tryin’ to raise out there.’” Frank Beal and his buddy just blinked at each other. Finally Frank summoned the courage to admit that they had virtually wiped out his frog farm the night before. “Needless to say, this information made Uncle Hurley pretty upset,” chuckles John Beal. Henry Beal learned all about construction when he joined the army during World War II. As a member of the Army Corps of Engineers, Beal helped direct the building of portable pontoon bridges as the U. S. Army moved through Europe. The bridges float- ed on water, supported by barge or boat-like pontoons to hold up the bridge deck and its dynamic loads. Pontoon bridges were vital to the U. S. Armed Forces as they marched toward Berlin. Sometimes Beal and his crew had to destroy a bridge after the Allies crossed over to keep the enemy from using it. It the army was on a long march, the bridges were sometimes collapsed and carried along. Beal’s American Army combat engineers succeeded in circumventing enemy forces who thought that could halt the advance of General George S. Patton’s tanks by blowing up big bridges. Beal and the boys were able to duplicate the carrying capacity of the huskiest span in approximately four hours. This was in spite of the fact that enemy snipers frequently fired shots at the bridge builders. Once Beal’s crew was finished, tanks and other armored vehicles were able to roar over the water. More than once Beal and his men saluted General Patton as his Sherman tank clattered across one of their bridges. They needed to be close at hand since, as the enemy retreated across rivers, they routinely destroyed the only bridge that could carry heavy traffic. When this happened, the wreck span would hardly hit the water before the army engineers rolled out of their camouflaged dispersal positions and started work on the near shore. Beal’s armored engineer battalion once built a 330-foot bridge in 3 hours and 2 minutes. These amazing achievements allowed for speedy crossings for heavy armor and much greater safety. By 1945, longer, sturdier pontoons, improved steel saddles and wider treadways made the bridges even sturdier. The construction crew not only had to be good, they had to be fast. The engineers and their teams were under constant pressure to quickly make bridges and clear the way for the Allied advance against Nazi Germany. After the war, Hank Beal decided to put his army experience to work. In 1947 he relocated to St. Louis and set up his own construction and roofing business. “He started out with a two-man crew,” says John Beal. “But he felt he had the knowledge and the experience to tackle any job. He could put on a new roof, tuckpoint a wall, or build a house from the ground up”. Compared to building a floating bridge in a matter of hours that could support a 33-ton Sherman tank while bullets were whizzing by his head, such projects were a walk in the park. During the Cold War, he built quite a few fallout shelters. As people moved to the suburbs he began building swimming pools. “Grandpa was a perfectionist,” says John. “During the war, people’s lives depended on him getting the job done right. When he went into business for himself everything had to be dead-on accurate. It didn’t matter if the customer was satisfied. The job wasn’t done until he was satisfied." Hank Beal’s business and residence were at 5024 Kerth Road in South St. Louis County. It included his office, warehouse, the PermaStone factory and a concrete dump. His land extended from Kerth Road almost to Highway 55. The Schnucks Supermarket at Butler Hill Road now sits on part of the property. Hank Beal retired in 1973 after suffering a stroke. “Not only did he have to stop working, he could no longer play music and that bothered him a lot because he loved music,” said John. Jerry and his brother Frank took over the business when Hank retired. “At this point, Dad and Uncle Frank began to concentrate on roofing, although they continued to do all kinds of construction work,” says John. “By then our reputation for quality work was well known in the industry, and we did a lot of jobs for large chain stores like Sears, Hill-Behan, Central Hardware and Builder’s Square. By 1974 Jerry Beal had a staff of 8 people, in addition to his wife. Frank Beal served in the military in Vietnam, and had to step back from the business after returning stateside because his health was damaged by the effects of the toxic jungle defoliant Agent Orange. Tired of the pressure of being the boss’ son, John Beal decided to try a different direction and attended nursing school But it wasn’t long before he was back with his dad. “I thought, ‘This is silly. Roofing and construction are what I know best. He’s my dad. We can work this out. Hank and Jerry Beal didn’t just pass along the family business. John is a third-generation guitarist with his Jack Cash Band. “We can play pretty well, but of course, we’re no Salt River Hoosiers,” he snickers. John Beal has offices in Kansas City, Wichita, Kansas, and Carbondale, Illinois. “But we work the entire states of Missouri and Illinois,” says Beal. “If you need a roof in Hannibal or Ste. Genevieve, Metropolis or Chicago, I can do it. "If you call John Beal, we will arrive when promised." Beal’s approach toward running his company has brought him national recognition. 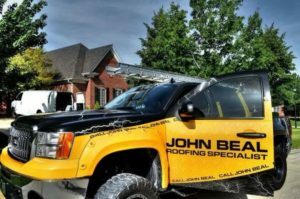 John Beal Inc. has been named one of the top 100 roofing contractors in the United States by National Roofing Contractor’s Magazine.